In a doomed attempt to persuade us that, if properly looked at, black can be white at the Tate Gallery, Sandy Nairne has performed a considerable public service. 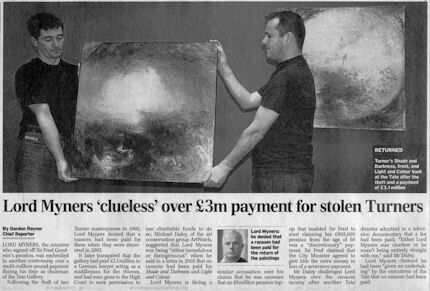 His forthcoming book “Art Theft and the Case of the Stolen Turners” (which we review in the September/October Jackdaw magazine) will prove an important, landmark work. 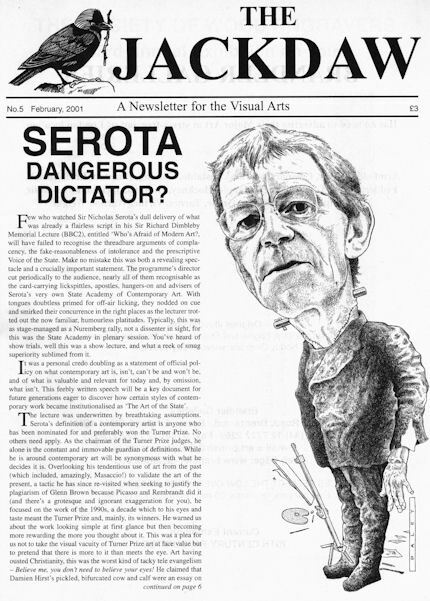 Ironically, had the Tate’s long-serving director, Nicholas Serota, not passed over his loyal deputy, Nairne, when appointing the first head of Tate Modern, the book would not have been written and we would not have gained so electrifying a glimpse into the workings of the Tate’s controversial management culture. In Nairne’s remarkably frank and informative account of his own central, eight years-long role in the recovery of the Tate Turner paintings which had been stolen in 1994 from a German museum (on the day when they had been dispatched without a Tate courier – see Figs. 2 & 5), we learn, for example, of “Nick” [Serota’s] confession that most of the Tate’s “positive” press stories are not real news but what he himself admits to be “merely promotional material”. On their recovery, the theft of the Turners was seen as an ill wind that might serve some institutional good – and not just because Tate had managed to possess both the works themselves and most of their insurance money. We see how, in hope of achieving for once a Genuinely-Real-Good-News-Story on the recovered Turners, attempt was made to thwart journalists who might spoil the party by pressing questions about the “recovery operation” which had already generated open scepticism and suspicion. It was felt that the museum’s press/public relations offices might need reinforcement to cope with a forthcoming barrage of criticisms and, “On Nick’s advice”, a formidable press consultant, Erica Bolton, was hired. She and the Tate’s press team groomed the gallery’s executive top brass (see Fig. 5) on how to answer or deflect journalistic probing by providing specimen questions and optimal, easily remembered answers. 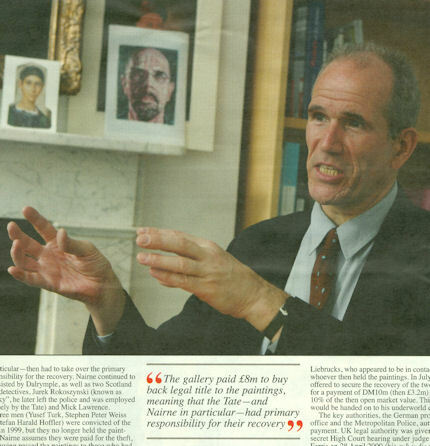 In an interview Nairne gave to Martin Bailey (“My life as an undercover negotiator”, The Art Newspaper, July/August, 2011), the reporter proved more outspoken than the Sunday Times’ art critic, saying, of a Tate press release carrying the Tate director’s outright denial that one of the two pictures had been recovered (when it had been recovered and was being concealed not only from the public and the press but even from most of the Tate’s trustees – see Fig. 2), that “This was simply untrue”. The untruth was, as it was intended to be, highly effective and it killed off a threatened Sunday newspaper article – which the Tate thought likely to have been informed by a senior Scotland Yard officer. With this throttling of a story, Nairne’s “fears about further investigative pieces, with imputations about ‘Serbian criminals’, receded”. Above, Fig. 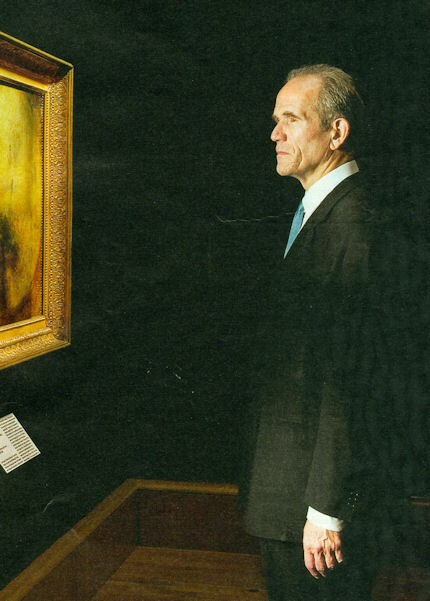 1: Sandy Nairne, now director of the National Portrait Gallery, surveys the Tate’s recovered Turners in the Sunday Times magazine’s photo-portrait (detail) by Manuel Vazquez. 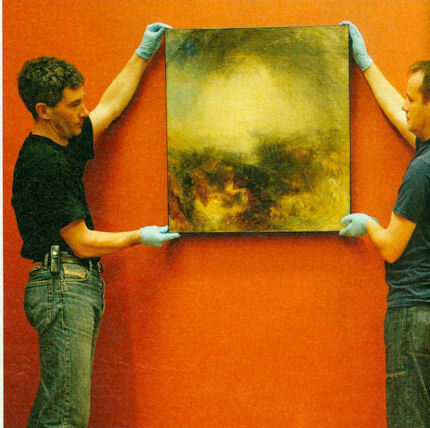 There has been much speculation over the years about the whereabouts of the two paintings by J. M. W. Turner, stolen in Frankfurt in 1994. And like the authorities in Germany, Tate has always been interested in any serious information which might lead to their recovery. But currently there is no new information, nor are there any current discussions being conducted. Of course I remain hopeful that one day the paintings might return to the the Tate. As described, left, this statement served to kill off an imminent newspaper story that would have disclosed the recovery of the first stolen Turner. On 26 April 1994, a registrar at the Tate arranging “all risks” and “nail to nail” insurance cover, at £12 million for each of the two paintings being loaned to Franfurt, wrote “Courier: works will be escorted to the airport, and thence by a British Museum courier. Agents will provide personal supervision throughout.” When we asked the British Museum’s courier of works (on paper) to the Frankfurt exhibition, if he had accompanied the Tate paintings from the airport in Frankfurt, he replied that he could not recall having done so but, he added, that did not mean that he “might not have done”. Above, Fig. 4: a report in the Daily Telegraph of 27 February 2009. 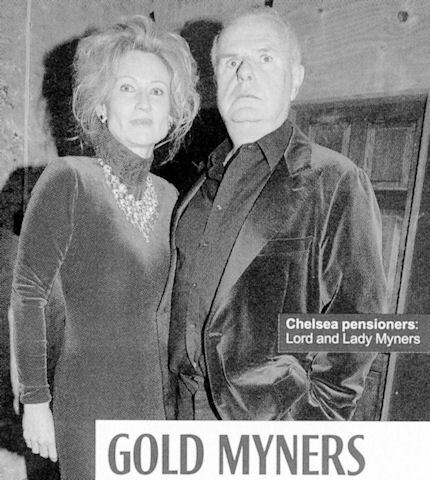 In ArtWatch UK Journal 26 we reported that the former Tate chairman, Lord Myners, who had given close to £10,000 to Gordon Brown’s campaign to become Prime Minister, was one of two businessman ennobled by the late Labour Government and dropped into office – in Myner’s case as City Minister. (See also “Lord Myners Watch”, ArtWatch UK Journal 25.) When the much-mocked Myners was chairman at the Tate, 23% of the gallery’s total investment fund of £27m was placed in hedge funds. As the Evening Standard reported (“Tate invites trouble by putting all its nest-eggs in one hedge”, 14 January 2010), experts in charity fund management advise clients to hold no more 8% in hedge funds and most charities have no holdings in such risky ventures. The outcome of the Tate’s hedge fund dabbling was a £1m loss – plus a £1.5m loss in the charity’s share portfolio. Above, Fig. 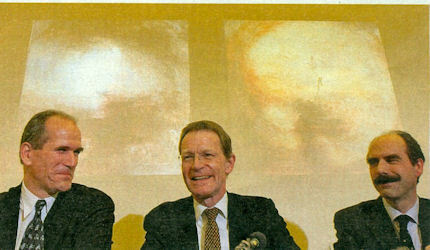 5: Tate players, Sandy Nairne, left, Nicholas Serota, centre, and Stephen Deuchar, right, announcing the recovery of the stolen Turners at a press conference in December 2002.